Well folks, I can no longer pretend it’s summer. Last Wednesday was 94 degrees. As I’m writing this, it’s now 53 degrees. To be honest, I’m not too upset summer has ended. Autumn is my favorite season after all. Of course, I may be singing a different tune once I get more into this semester. Just because I had to say goodbye to summer, however, does not mean I have to say goodbye to summer food. Which brings me to shush kabobs. Oven roasted shush kabobs to be exact. Now you can have a bit of summer in the dead of winter (or any season!). I didn’t actually design this recipe with cold weather in mind. Really, I was just trying to find a way of making shush kabobs without using a grill. Unfortunately, I’m not allowed to so much breathe near the grill at my house. I think it must be a man thing. Kinda like how men cannot ask for directions. Men cannot let women grill (no offense to anyone out there!). So, I went to my mom’s house to use hers. Except… well, maybe men do grill with good reason (again, no offense!). Main point being, I had to find a way to make these sans grill. NOTE: the first time I made these, I placed the ham in the oven with the rest of the shush kabob (which is why the ham in the picture is integrated in my fruit/veggie pattern.) Do NOT do this! The ham quickly gets all mushy and slimy. I made this again in the way it states in the directions and problem solved! Just don’t cook the ham. Since I used precooked ham, I don’t know how any uncooked ham or other meats will work with this. Cut pineapple in half and cube into pieces. Reserve 3 tbsp of pineapple juice and store cubed pineapple in fridge. Combine soy sauce, apple cider vinegar, oil, garlic, and reserved pineapple juice in a bowl. Add in ham. Place in fridge and let marinate for at least 1 hour. Preheat the oven to 450 degrees. Line a baking pan with foil. With each chop stick, pierce onion, peppers, and pineapple into desired pattern. Place onto pans. Once ham has done marinating, remove ham and drizzle/rub about 3/4 of marinade over shush kabobs. Place in oven for 10-12 minutes. Once out and cooled slightly, add on ham to each end of shush kabobs. 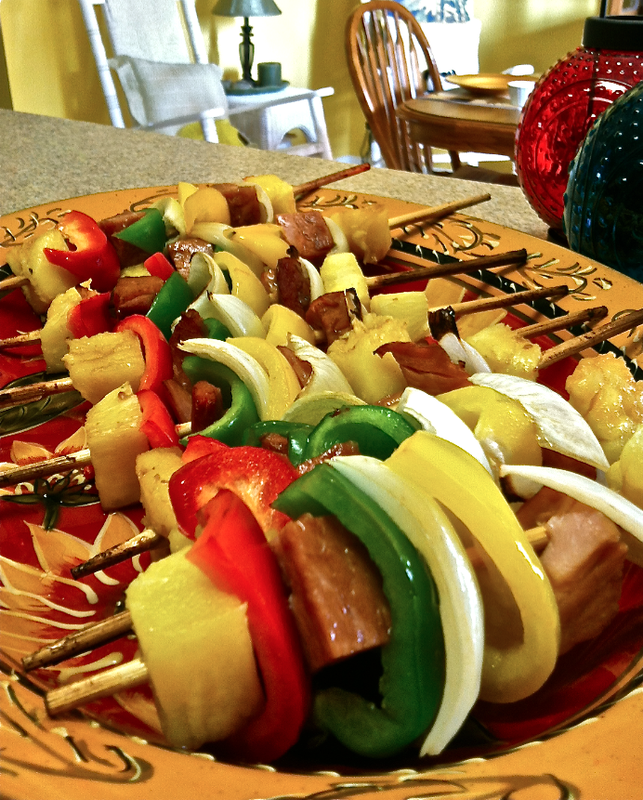 Drizzle remaining marinade over shush kabobs before serving.